Brexit: a second chance for the Norway option? Having virtually written off the Efta/EEA solution – after the joint efforts of Mrs May and the "Ultras" – we now see it re-emerging from an unexpected quarter, the European Commission, which seems to be suggesting this option as a way of squaring the circle on the transitional phase. The source of information on this surprise development is Politico.eu but, noting the outpouring of ignorance of its two authors, Guardianista Simon Marks and Hans Von Der Burchard, it seems we have a long, long way to go. As to the substance of their report, the sub-heading gives the game away, as it declares: "Mimicking deal EU has with Norway would keep UK in single market during Brexit transition". But, in a way that is hardly gauged to promote wild enthusiasm from the Brexiteers, we are told that this would not only keep UK trade going with the EU after Brexit, it would "also keep Britain under the EU umbrella". Thus, the idea, which we have been floating for more than three years in Flexcit - for precisely the opposite reason - has now become Brussels' "plan B", with the commission suggesting that the UK temporarily becomes a member of Efta. But in a narrative which demonstrates the Mr Marks and his partner have learned precious little over the years, we are further told that Efta membership "would allow the U.K. to apply for membership in the European Economic Area", which "grants free access to the EU's single market". Yet those of us who are better informed (which is an awful lot of people) know that we are already in the EEA. Furthermore, there is a distinct possibility that, as long as we can arrange Efta membership to cover us when we leave the EU, we need not re-apply. Our EEA membership should carry over with our new (or resumed) status. Nevertheless, one European diplomat has it right, telling Politico.eu: "It's an interim solution that causes the smallest possible disturbance for business on both sides of the Channel". And like Norway, the UK would not be part of the customs union, which means it could strike its own trade deals with countries around the world". The problem, however, is that both "hard-line Brexiteers" and the likes of Mr Marks share a strand of profound ignorance that is difficult to breach. Say Marks and his colleague: "Such a plan … is a toxic idea for many hard-line Brexiteers because it would require the UK to accept the four founding EU freedoms of goods, services, people and capital". In the rarefied and detached little world inhabited by this pair, Article 112 does not exist. The "Liechtenstein model" never happened. And, to add to the litany of ignorance, we are told that, "Britain would also have to continue paying Brussels in exchange for access to the EU market". After all this time, and all the debate we've having on this matter, you'd think that these people would at least get the basics right. "Norway will have paid €1.3 billion to the EU between 2014 and 2021", they say – making an assertion that simply is not true. For sure, Norway pays for services rendered through the decentralised agencies, but it retains control of its expenditure on EEA/Norway grants. Sadly, not only do we get this low drone of ignorance, it embellished by the the same tedious mantra, that the UK "also would have to fully implement EU laws and regulations - while losing any say in drafting or vetoing them" – again an egregious untruth. Called in aid to make the option appear even less attractive, we then have Guntram Wolff, director of the think-tank Bruegel. He obligingly tells us: "It still means accepting supranational jurisdiction", adding that, although Efta's members are not directly bound by the ECJ, the Efta court, which largely follows the jurisdiction of the ECJ, does have oversight. Then, just to rub it in, Andrés Delgado, a trade lawyer from the Max Planck Institute Luxembourg, says: "The Efta court judges on the basis of EU law, so it's not as if you were really leaving the realms of EU jurisdiction". The way this is couched, therefore, it is almost as if our narrators don't want it to fly. Remarkably, though, officials in Brussels still hope that once the reality of a "hard Brexit" comes closer, the UK might become open to the Norway option, "at least as a temporary solution". What is apparently attracting Brussels to the idea is that it would ease fears of legal problems at the WTO, where other countries might challenge the interim agreement if negotiations on a succeeding trade deal drag on. "An EEA-type transition would help avoid complaints during the transition phase", says the senior Commission official who is so willingly keeping Politico.eu informed. For all that, I've been taking the view that the existing Efta members would not necessarily be terribly keen to see the UK on board, if this is presented as the second choice by a less than enthusiastic Mrs May. But, it seems, there could be an opening. Oda Helen Sletnes, Norway's ambassador to the EU, says: "Overall, it is in Norway's interest to maintain as close trade policy cooperation with the UK as possible, with as good a level of access to the British market as possible". However, there is nothing at all here that makes the idea attractive to the "Ultras" who have made it their business to be opposed to the Single Market. The idea of the "Norway option" was so roundly trashed by both "leavers" and "remainers" during the referendum campaign, and then by Mrs May, that it is going to require considerable rehabilitation before it will be entertained – if at all. Neither does this story help. 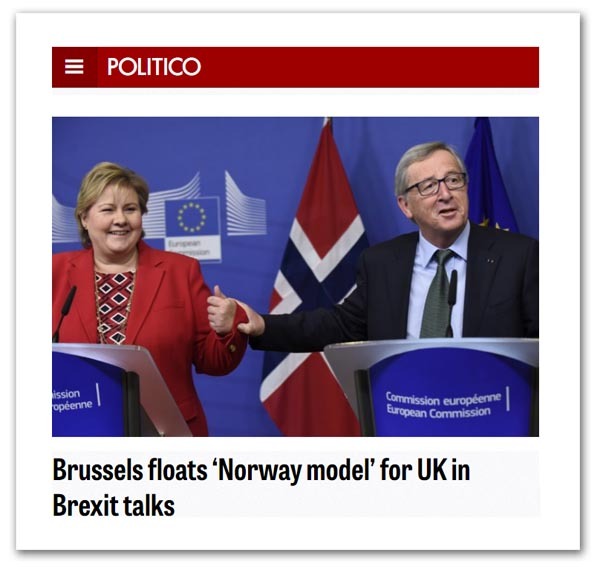 With the Single Market having been enthusiastically embraced by "remainers", thereby poisoning the well, endorsement of the "Norway Option" by the "heart of evil" – none other than the European Commission – could be just a tad counterproductive. Those who mistakenly believe that continued membership of the EEA means that we stay in the EU will now be convinced that that their beliefs are correct. For the Government, things may not be that much better. If this plan gets wider circulation, then any chance Mrs May might have had of convincing her "Ultras" that the Single Market is a good idea has probably evaporated. For all the self-importance of Mr Marks and his friend, however, the story so far is confined to Politico.eu. The rest of the legacy media hasn't touched it yet, and it doesn't look as if it will. Nevertheless, there is a huge irony here if the Commission really is supporting the idea of the UK taking up the Efta/EEA option. It will be promoting perhaps the best chance we have of making a clean break from the EU – and then most likely meeting resistance from those who profess to be keenest on leaving. Not even Lewis Carroll could have dreamed this one up.